Updated. “Have you seen how well my squash are doing?,” asks a gardener on a recent summer day at the Emerson Avenue Community Garden (EACG). It’s not a hard question to answer as the garden is currently in full bloom with its 38 community plots teeming with fruits and vegetables including tomatoes, different varieties of kale and lettuce, beets and strawberries. Since breaking ground on the garden located on the campus at Wright STEAM Magnet (WSM) in January 2011, hundreds of volunteers and dedicated community members have spent thousands of hours transforming a once unused plot of land overrun with weeds and used as storage, into a thriving community garden that is feeding its gardeners and the needy through donations sent to the food pantry. Community is definitely the overriding theme at the garden. Growers are eager to share best practices and their harvests and on any given weekend, volunteers can be seen tending their plots, working on projects to help beautify the garden and checking on the open compost system. First Saturday of the month workdays have brought dozens of volunteers to the roughly 1-acre lot and have led to the creation of an outdoor classroom space and a pollinator garden. Being on the campus of a middle school, it’s not surprising how important education is to the EACG’s mission. Nelson, who is also the Education Committee chair for the non-profit, hopes to reengage WSM in participating in the garden. The committee is currently working on creating curriculum that incorporates gardening with the school’s STEAM (science, technology, engineering, art and math) focus. The garden has 34 small plots that are allocated for WSM and WISH Charter, which is co-located on the campus. The garden also keeps five plots for community education. EACG regularly holds workshops led by master gardeners who use the plots for demonstration purposes. 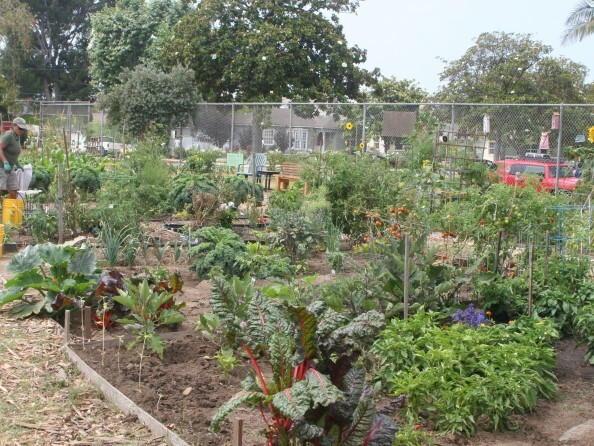 Groups like the YMCA and local churches have used the community plots to help promote healthy eating and to show how successful a backyard garden can be. When school is not in session, the garden is open from sunrise to sunset and the community is invited to explore the area and take advantage of its outdoor classroom. Since the land is being used by the EACG through an agreement with LAUSD, all visitors are asked to sign a liability waiver when visiting. During the summer months, the garden is open for a variety of free activities geared towards children including “Story Time in the Garden” every Tuesday at 10 a.m. Thursdays at 10 a.m. volunteers from LA Arts Collective and Musical Beginnings help lead a music and movement class. While visitors are always welcome to the garden, EACG members are currently inviting the community to their biggest fundraising event of the year, their second annual Midsummer Night’s Dinner. This year’s event was to be held Saturday, July 12 from 6 to 9 p.m., but has been rescheduled to Saturday, August 23. The event will be held al fresco in the garden located on Emerson Ave. in Westchester between 80th Place and 80th Street. Tickets are $65 and include dinner, live music and camaraderie. The appetizers and salad course will be made with the garden’s produce. Interested in learning more or purchasing tickets to the Midsummer Night’s Dinner? Please visit eacgc.org. Volunteers also have a booth at the Westchester Farmers’ Market the third Wednesday of the month and a master gardener is on hand to answer gardening questions. The fourth Saturday of the month the group is at the Playa Vista’s Farmers’ Market.